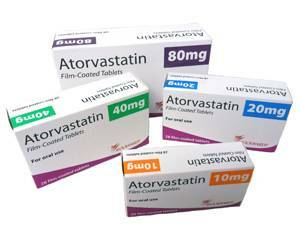 Atorvastatin is a cholesterol synthesis inhibitor. It inhibits the formation of cholesterol in the liver and thus lowers the cholesterol- and fat levels in the blood. Cholesterol and triglycerides are fat-like substances that the body uses to make cells, hormones and bile. Cholesterol is required to process fat and transport it through the body, and triglycerides are important for the supply of energy, and the build-up of cells. Too much cholesterol can, along with the fats, deposit inside the blood vessels, which make them more narrow or clogged. A high cholesterol- or fat level in the blood may occur because the body produces too much of it or because too much fatty food is eaten.Also an inherited form of high cholesterol levels exists. In addition to the desired effect, this medication can also have side effects. The following side effects may occur. For a complete overview you should to read the brochure. You should not use this medication if you have a liver disease or if you are pregnant. Immediately stop the treatment and consult a physician if you experience the following symptoms: swelling of the face, fever or blistering / severe rash of the skin. Some medicines may influence the effect of the drug or may be affected. This type of interaction may reduce the effectiveness of both medications, and increase the risk of side effects. Please read the brochure attentively before use and if you undergo any medical treatments you should mention the use of Atorvastatine. Before you start the treatment you should follow a cholesterol reducing diet. This diet should be continued during the treatment. Usually the starting dosage is 10 mg once a day for adults. If necessary, this can be increased to a maximum dosage of 80 mg for adults and 20 mg for children. The tablets should be swallowed as a whole with a drink of water and can be taken at any time of day, with or without food. Do try to take the tablet at the same time everyday. After 4 to 6 weeks the maximum effect of this medication has been reached. You will not notice much of the working of the medication, the results can only be shown after a blood test. It is important to take the medication daily, only then the desired results can be achieved.